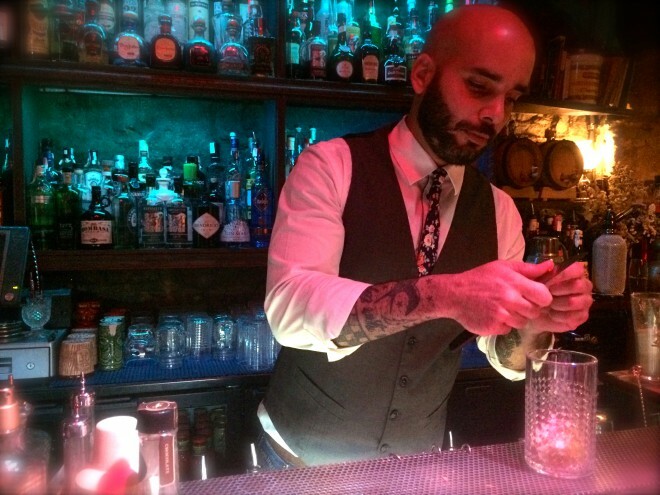 Fernando Requena, is a bartender at Collage in Barcelona. He makes two cocktails for us, one is with gin and carpano, and the second is with tequila and grand marnier. I’m Fernando Requena and I’m the co-founder of Collage in Barcelona, which opened 3 years ago. I am from Venezuela and I’ve been living in Barcelona since I came to study business administration 13 years ago. During my studies I worked as a bar back and watched how bartenders made cocktails and as I learnt and played around with flavours, I fell in love with this job. So after graduating, I began working in bars full time. I prefer this job because clients come to the bar, they don’t know what they want and you can see the happiness on their faces when they taste what you’ve done… I need this moment. My goal is giving happiness to people, whether it be for one hour, one night or just for a moment in their life, that’s my utopia. Of course I love alcohol and I get to play with spirits, vermouth and create cocktails. We make our own bitters, syrups, vermouth and infusions here. Our idea is to make modern cocktails whilst keeping them classic in style. A lot of bartenders come to see us on Mondays when they are closed, so I think that’s a good sign. Our bar is the bar we wanted. A quiet place to enjoy cocktails, it’s not too big and not on the main street, similar to a speakeasy. Many friends say that it’s the perfect place for a first date. It’s a little dark, with good service, good cocktails and cosy seating and design. If it was bigger we couldn’t have the same level of service we have now. We have time to say hello to everyone, give advice on the cocktail menu and the spirits. When I have time to go out I like to go to Carabean club, the guy there is like a cocktail encyclopedia, and they have a huge selection of rums which I love. I love rum. The varieties are endless, it depends on the country of origin, the ground, the way it’s made and the aging process. So there is a lot of variety and ways to mix it. I have drunk rum all my life, so I feel comfortable working with this spirit, because I know it so well. A good cocktail for me is about the love you put into it, like in life. You have a recipe like a Manhattan or a Martini and any bartender knows how to make it. But they never taste the same. You can see how a bartender makes a cocktail and whether it is with passion or not. Vermouth for me is something huge, it can make the character of a cocktail. Vermouths are produced everywhere from France to Spain and Italy, so the flavour profiles are varied. When you stir a cocktail with vermouth, you can smell the whole flavour of the vermouth. My favourite is Carpano Antica Formula. My favourite place in Barcelona is Creps al Born and Little Red Door in Paris, Remy is an artist.